I’ve never had a wheat whiskey before. I had tried the Four Kings collaborative whiskey, one-eighth of which was Corsair Distillery’s whiskey distilled from smoked wheat. As someone who seems to find hints of vanilla and/or cinnamon in nearly every whiskey I drink, I noticed neither of these here. The flavor of the grain stands out in this whiskey. Usually, that’s not necessarily a bad thing. I like the spicy/sweet of rye, the sweetness of corn and the buttery notes that usually come with barley. Wheat, however, just reminds me of bread, and not the robust flavor of rye bread or yummy banana nut bread. Just plain wheat bread. If a whiskey isn’t aiming for sweet, I’m okay with that. However, it needs to be bold in the flavors that it is aiming for. If a whiskey is intended to have a woody flavor, I can get on board with that. But I’m not sure what the Bernheim Wheat is going for, other than the flavor of the wheat (perhaps playing that “unique” angle), but the wheat grain just isn’t strong enough to carry the flavor all on its own. I noticed some saltiness and roasted nuts flavors. As the whiskey lingered, wood flavor came through, particularly at the very end. As someone who started from Scotch and then began learning about and trying bourbons, I hoped this might give me a nice option for something in between the two. Unfortunately, whether it’s Scotch, Bourbon or otherwise, I like my whiskey’s to be strong and bold in flavor, not subtle. 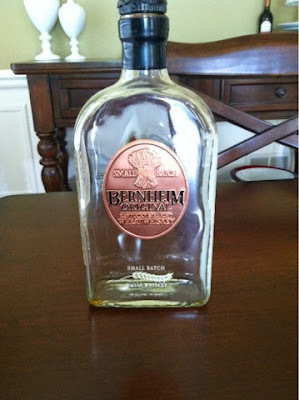 The Bernheim Wheat just comes across as soft. It’ s tasty and inoffensive, but not overly impressive.